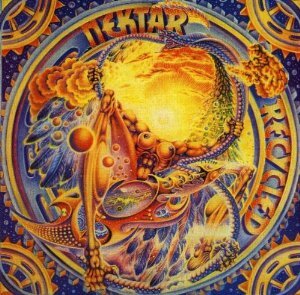 Nektar’s third and most intriguing American release, Recycled, superbly incorporates electronic elements into a solid rock foundation while eschewing the gimmickry that partially marred last year’s Down to Earth. If you fail to respond to the rich, tightly knit sonic landscape on Recycled, then the person next to you should call an embalmer. According to a record company press release, the story represents “a multifaceted excursion into an ominous future brought on by runaway technology”; but if you ask me, a lot of this is gibberish. perfectly attuned Moog arrangements and performances here produce one of the best marriages of rock and electronics ever and leave little doubt as to why the keyboard wizard has since been named as the group’s sixth full-time member. Like the tunes on 1974’s Remember the Future (which told of a winged creature that might well have been dubbed “Jonathan Livingston Bluebird”), Recycled‘s songs present a story that seems trivial and cryptic. According to a record company press release, it represents “a multifaceted excursion into an ominous future brought on by runaway technology”; but if you ask me, a lot of this is gibberish brought on by a runaway mouth.